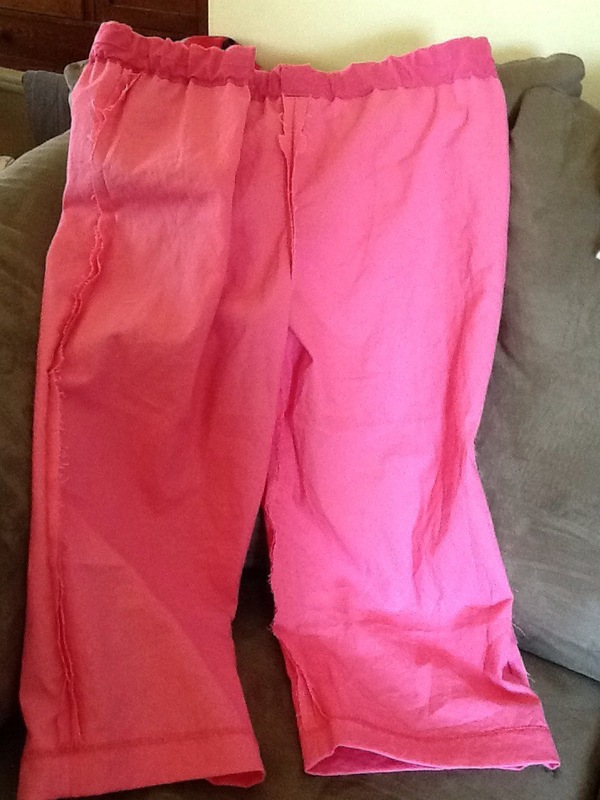 The seven year itch to finish the 7 year pant project. I cut these out at least 7 years ago. I don’t know if I cut them out before my second child was born, or between my first and second. I know that both my two older kids were dedicated at the Baptist Church and I know that I cut these out at a craft retreat with those ladies from that church. These are for me. These are a summer Capri pant. The fabric is real linen, something I was obsessed with wearing all the time before motherhood. Before I discovered that Lycra after baby is best. Before I had a sack of elephant skin on my belly leftover from pregnancy that won’t go away. I bought the fabric in Nova Scotia at a buy 2 get 1 free sale at FABRICLAND. Imagine coming home from vacation with a suitcase heavy with linen fabric…my hubby was NOT impressed. But real linen! In such a beautiful solid color! On sale! How could I NOT??? 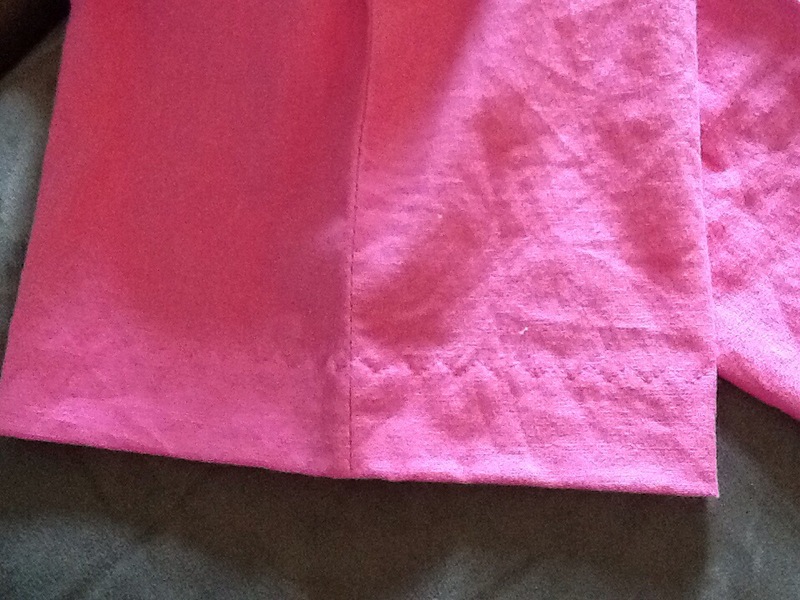 A better look at the fabric, and a close look at my favourite stitch on my current sewing machine. I have never had this seam pop because of too much strain on the seam by the wearer. Before my new serger arrived a few weeks ago, this was also how I finished off all my pieces to prevent fraying before sewing. It’s a sort of a zig zag. It gives a little, it stretches a little, but it’s prettier and less obvious than a traditional zig zag that so clearly shouts HOMEMADE!!!!! when you see it on a garment. And, it’s not too hard to rip out. Because I make a lot of mistakes. In the seven years since I have cut these out, I lost some of the pieces, but each time I found them again, I would attempt to put at least one more seam in before I set them aside to be lost in the abyss of the basement again. Eventually, all the pieces were together in one!!!! This is how I discovered them this time, in the midst of my turn all my fabric into pants project. All they needed was a waistband and a hem. I added bias tape for a waist band. This is also my new thing that I am doing on all these pants I am making. 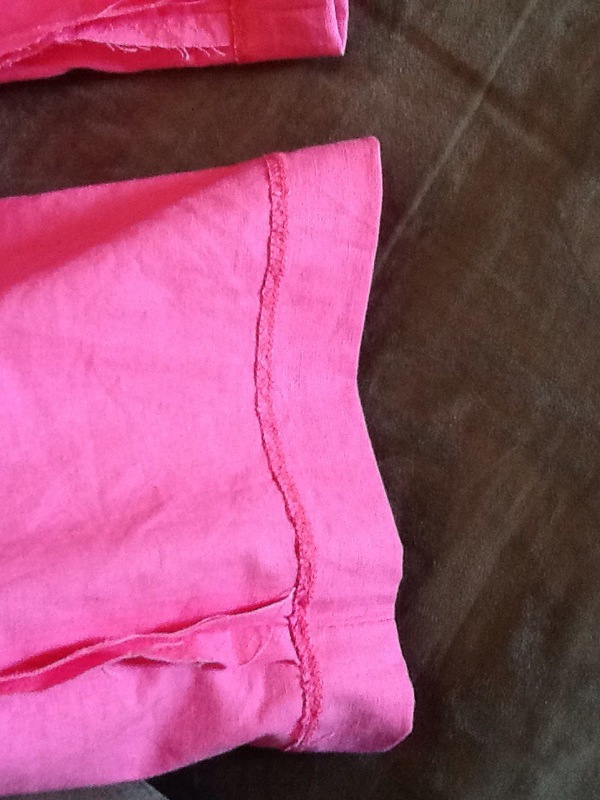 I FOLD the bias tape over to hide the join, and it leaves an opening for elastic to thread through that I DONT have to sew shut after. 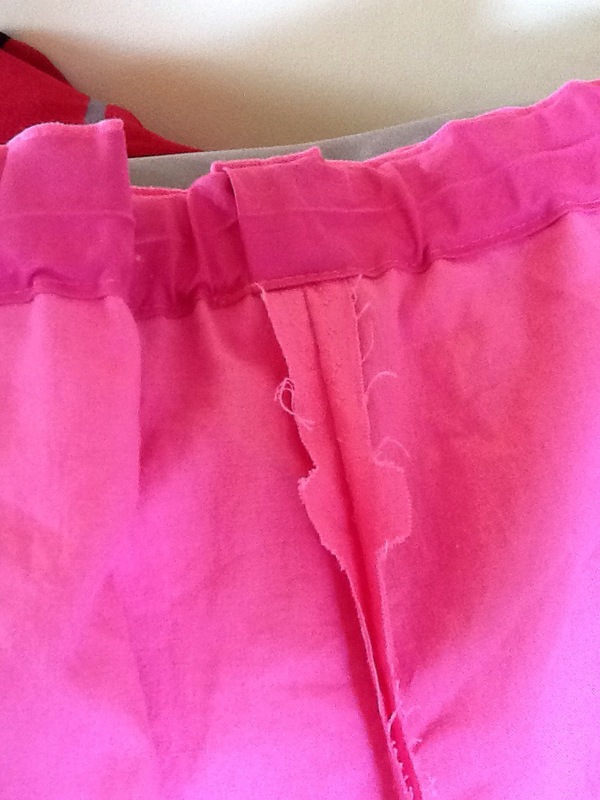 Meaning I can replace or resize the elastic at any time in the life of the pants. This is big for me, because I am hoping that pants I sew for my 9 year old will also eventually go onto my 7 year old and then my 3 year old. They are after all, all the same gender. Perhaps only a dream. And for myself, I really really really want to drop a few pounds now that my tubes are tied and we are really really not going to have any more, so hopefully, I can tighten the elastic as time goes on if need be. 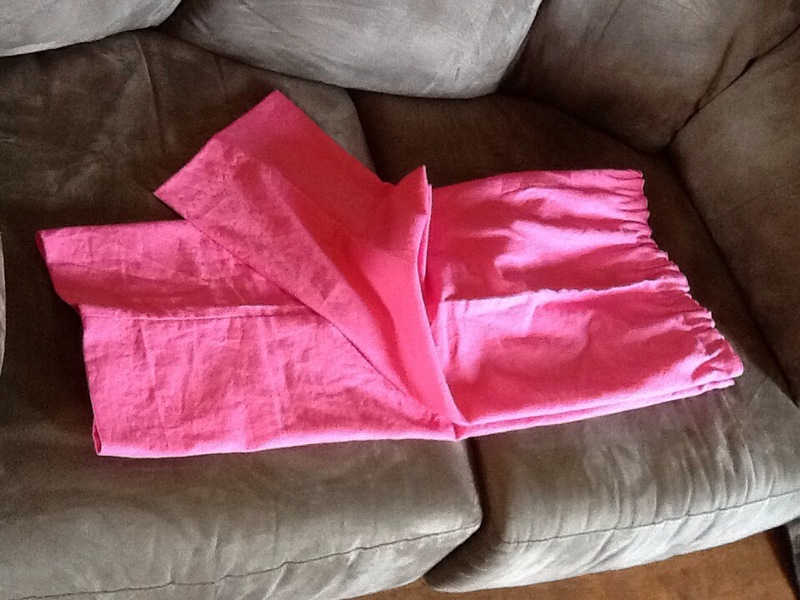 As you can see, I was able to try out my new serger on the hems of these capris. Over all, I am very pleased with the results, despite the fact that it took me at least 7 years to finish these. I am just glad they are DONE and out of my basement and can be useful now. Other great news, I think I have finally figured out WORDPRESS. The iPad app is way easier to use than the PC version. Baby number 4 was born July 5th. I NEVER expected it was a girl. The fabric store looks like a whole new adventure now that I have a little girl. I’m still in shocked and stunned mode, but already I love her so much. I will try to get around to posting pics of all the projects I completed in June. I am very proud of how much I did get done. I do have a project I will be working on over the summer…cutting out quilt squares for my next patchwork quilt. For this project, I am going to try using a variety of fabrics with varying weights and textures instead of sticking with quilting cottons.